I've got something very special and exciting to share today! 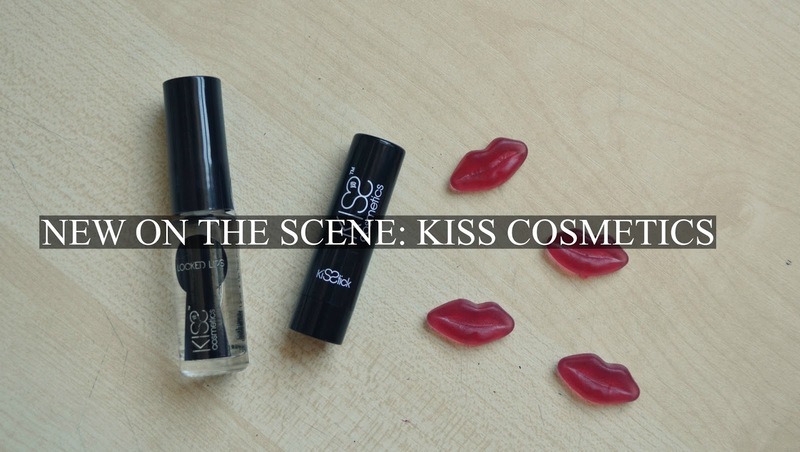 I'm a big lover and supporter of new up and coming beauty brands, so I was over the moon when new beauty cosmetic brand Kiss Cosmetics selected me to review one of their brand new sparkly products before it launches. There's nothing quite as good as getting a little sneak peak of a beauty product before it is launched out into the world! So far only one Kiss beauty product has been launched - a lipstick called the Kisstick, which comes in 10 different colours. All I've seen is positive reviews about the Kisstick so far, so I was really happy when Kiss Cosmetics included a mini sample in my package. I was kindly sent the brand new Locked Lips lipstick seal to review which is set to launch on the 29th April 2015. I'll firstly start with my thoughts on the mini Kisstick. I received the Toxic Kiss Kisstick, described as a 'cool toned neon pink'. 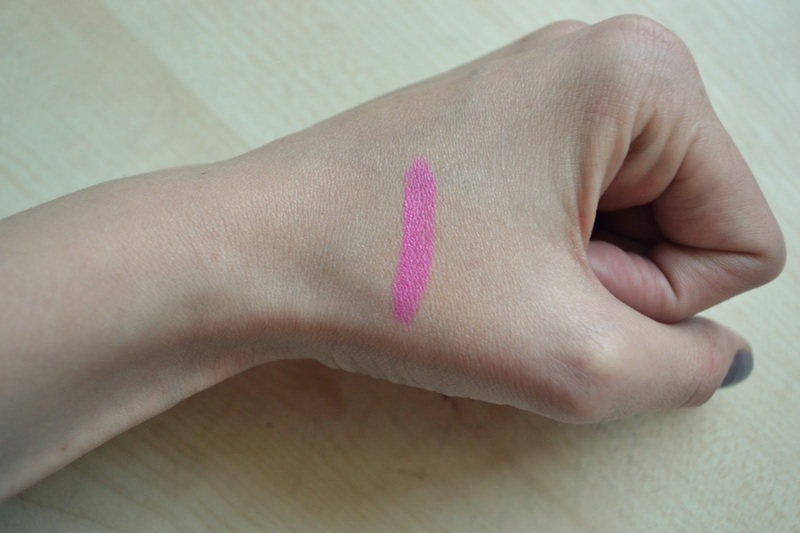 As you can see from swatch in the above picture, the lipstick is highly pigmented and stays true to its 'neon' description. I don't usually go for neon pinks, but I have to admit I'm a big fan of this shade (and all of the Kisstick shades for that matter). Although it is vibrant and bold, there's also something quite soft and pretty about it. I tend to suffer from dehydrated and dried out lips, so when buying a lipstick the first thing I look for is that it's going to keep my lips hydrated and soft. Luckily this little lipstick did a fine job of keeping my lips moisturised, with its creamy texture which glides easily and evenly onto the lips. As with any moisturising lipstick, you do need to reapply it more frequently throughout the day but considering my lips felt super soft after use, I didn't mind having to touch up every two hours. When I received the Locked Lips lipstick seal, I was really excited because I've never tried anything like this before. I've only ever put clear top coats on my nails, so I was interested to see how it would do on my lips. The idea of Locked Lips is to seal in your lipstick and prolong the staying power, acting as a 'lock' for your lipstick - an idea I love. Locked Lips comes in a little glass bottle with a standard nail varnish brush to apply. When I first used the Locked Lips top coat, I did find that it felt a little uncomfortable and strange on my lips, leaving a tingly almost burning sensation. This quickly died down, however, and I found that the Locked Lips dried quickly on my lips without feeling sticky. Although the smell of the lipstick seal is pretty strong and industrial, this too died down after a few seconds and once it had fully dried I wasn't aware of the smell at all. I found Locked Lips to last for around three or four hours at a time, and it definitely prolonged the staying power of my lipsticks which can sometimes only last up to two or three hours. I found that it doesn't just hold your lipstick in place, it also locks in the bold, vibrant colour too - meaning my lip colour never dulled. I'm a huge fan! A full sized Kisstick is available for £7.00 and the Locked Lips lipstick seal will be £3.50 when it launches next Wednesday. I feel pleasantly surprised with the products that Kiss Cosmetics sent, and I have a good feeling about this little beauty brand. Stay tuned! 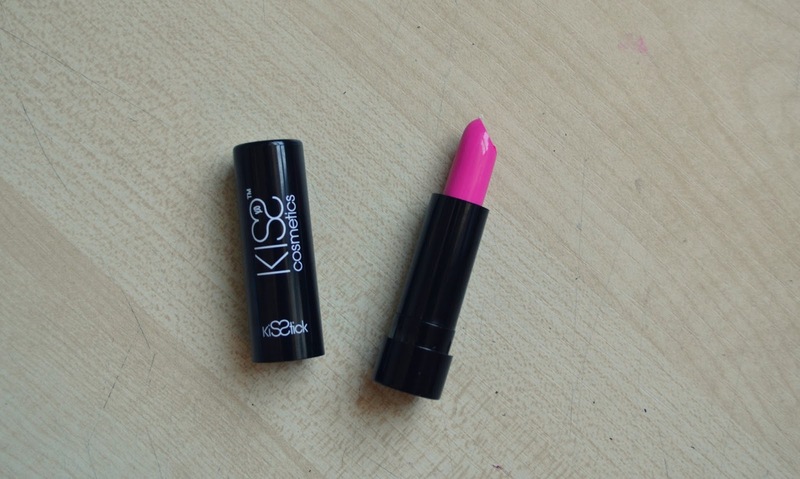 I love that it's called a Kisstick and it's reasonably priced too. I love the colour, perfect for summer! Wow the Toxic Kiss Kisstick really is a neon pink! I am not sure I am bold enough to carry it off, but it looks like a great shade for summer. I like the idea of the Locked Lips, anything that prolongs the staying power of a lippie is fine by me! Amazing pigment on that lipstick! Love finding new make up brands and I've been after a good affordable lipstick. Thanks!